We are incredibly excited to see our newest app Numerics for the iPhone and iPad featured in the Business Category on the US App Store! In India too, Numerics has been featured on the App Store home on the iPad and in the Best New Apps List on the iPhone. 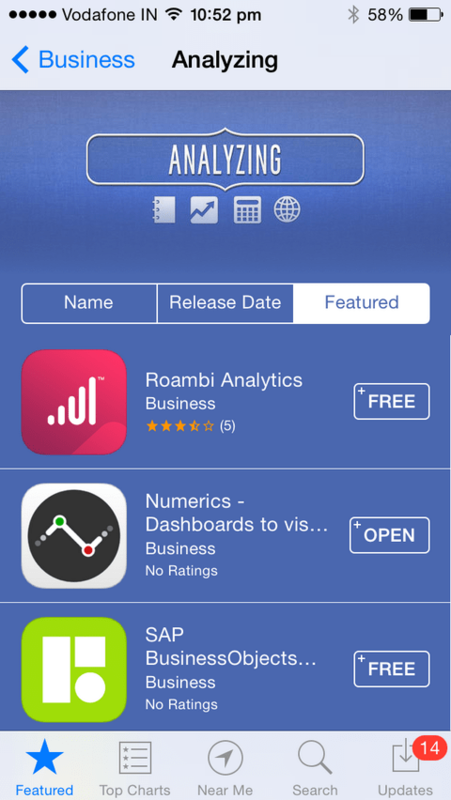 Numerics has also earned its place in the Analyzing list along with many popular business apps. We are thrilled with the response Numerics is getting from the App Store, the media and our customers alike. Mel Martin over at TUAW recommends picking up Numerics, he says - “It’s easy to use, very customizable, and inexpensive.” And Patrick Jordan of iPad Insight thinks “Numerics is a powerful tool for presenting some meaningful numbers from those (integrated) services.” Bastiaan Vroegop of the Dutch site iCulture thinks the biggest pro of Numerics is the AirPlay mirroring feature to project your dashboards to an HDTV with a unique, big-screen UI. We’ve been getting awesome suggestions and feedback from our users. We are thrilled that so many of our users are as excited as we are about the possibilities Numerics brings to the table, and we are already working on some impressive features that you are all going to love. Keep watching this space for more news and updates. As a special launch offer, Numerics for the iPhone and iPad along with its hundreds of custom widgets is available just at $19.99 (or equivalent in other countries). Users of Numerics v1.0 will be treated to all future paid widget packs for free. No additional costs and no subscription fees ever!